One of the longest established city academies has been condemned by Ofsted, a year after failing an inspection and being ordered to improve. 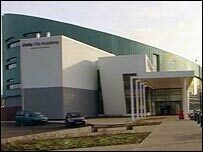 Inspectors said truancy, poor teaching and "exceptionally low" results meant Unity City Academy in Middlesbrough had made "inadequate progress". The school's new chief executive, David Triggs, was appointed by the Department for Education to turn round the school. He said he was "disappointed but not surprised" by the inspectors' verdict. Under the prime minister's education reforms failing schools which do not improve within a year will face being closed down. Mr Triggs said such a deadline would be virtually "impossible" for schools in Unity's position. "Schools like Unity are in very challenging circumstances," he said. "You have to be realistic. To turn a school like that round in 12 months is, I believe, nigh-on impossible." The government's usual recourse in such circumstances would be to replace the failing school - with an academy. The Department for Education and Skills was asked if Unity would be shut if it continued to make "inadequate progress". A spokesman said ministers wanted it to improve "quickly", and a "robust" monitoring system had been put in place to achieve this. He continued: "We are well aware of the problems and are taking positive steps to turn the academy round." Academies are independent state schools with external sponsors, set up to raise standards in deprived areas. Backed by business support services firm Amey, Unity opened in 2002 and teaches about 1,200 children aged 11 to 16. It was one of the first schools to open as part of the government's £5bn programme for transforming failing comprehensives. However, it was placed in "special measures" in March 2005 - told it was failing to do an adequate job and given notice to improve, with extra support. pupils made "exceptionally low" progress between the ages of 11 and 14, particularly in English and science where progress was "among the lowest in England"
an "unusually large" proportion of pupils gained no GCSEs at all. The inspectors were also highly critical of the academy's new buildings which are designed with a series of balconies - which the school now plans to scrap. "The nature of the building, while impressive at first sight, means that some students do not feel safe or secure. No-one is satisfied with anything about the place at the present time. "The layout of corridors is confusing and high open balconies and stairwells are daunting." Behaviour had improved, the report said, but overall progress on improving attitudes and attendance was "inadequate". Mr Triggs was appointed as an executive head in January. Also the head teacher of the successful Greensward College in Hockley, Essex, he has a reputation for improving failing schools. He said there were "green shoots" which showed that improvements were being made. But he said: "No-one is satisfied with anything about the place at the present time. "My ambition is to turn it into a highly successful school. The curriculum has got to be changed and the beliefs of the community have got to be changed." To this end the DfES has agreed to switch the designated specialism of the academy from technology to vocational education from September 2006. The government admitted there was "much work to be done" to turn round the academy but stressed recent action was starting to have a positive effect.